We have been traveling the world with our kids since they were infants. And no doubt, it has been challenging to juggle sleep schedules and potty routines and short attention spans with trying to see as much of a new place in the few vacation days that we have. But then a trip like this happens and all off those initial struggles suddenly become worthwhile. Seejo and I had coincidental work trips to Salt Lake City (and suburbs) around the same time. After a bit of adjusting, we managed to get those schedules coordinated in the same week. 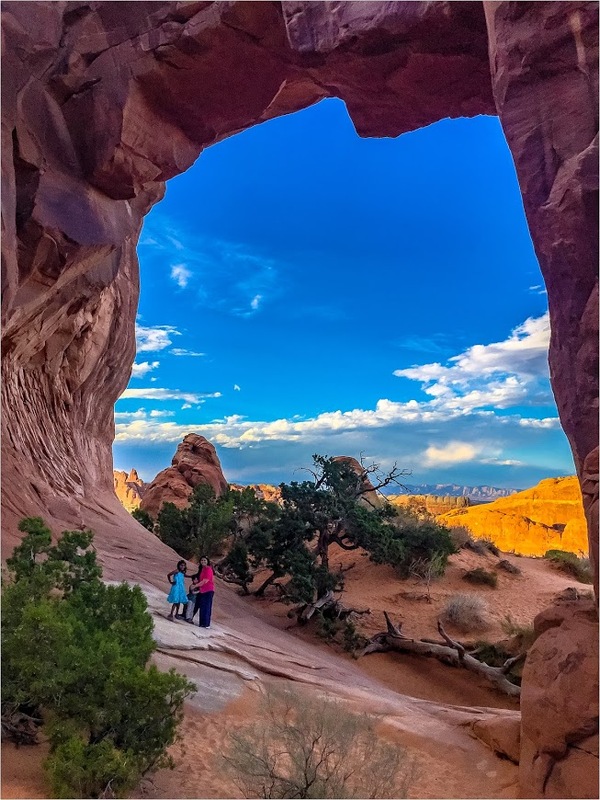 We took turns working Thursday & Friday with the other one managing the kids and then could wrangle time to see Arches National Park and Canyonlands National Park over the weekend. Early Friday evening, we drove the 3.5 hours from Orem (where Seejo’s Utah office is) to Dead Horse Point State Park in Moab. The kids had spent the morning in the hotel pool so they were pleasantly tired out and happy to nap in the car. The drive was beautiful – minimal traffic, huge mountains that changed color from white to gray to deep red as we neared the town of Moab. We reached Dead Horse State Park around sunset – there is a massive rock formation right at the entrance which totally dwarfed our car. Opposite the entrance is a Moab Giants Dinosaur Park – that looked very interesting but it was closed by the time we got here. Dead Horse state Park has an impressive look out of the Canyonlands National Park with its red cliffs and a valley through which the Colorado river snakes its way. 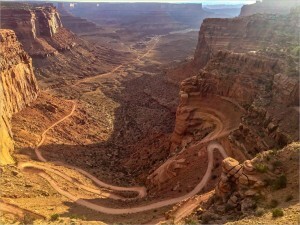 The view of the canyonlands with a gooseneck bend of the Colorado river is not surprisingly a popular photo spot. We managed to get there in time for the sunset to get some beautiful pictures. The kids were happy to be out of the car and collecting the rocks. One unique feature of the Dead Horse State Park is the several trails with tiny piles of stones (cairns) marking these trail heads. The kids had a nice time trying to add more rocks on existing piles. We never really understood why the park is called Dead Horse State Park – google showed us several stories but there is absolutely no doubts about the view. By this time it was dark and we were ready for dinner. Our hotel provided us with a handy restaurant guide and we picked a Mexican restaurant in Moab called El Chorro Loco – excellent food and really fast service. In fact all the restaurants we tried in Moab (lunch at Sweet Cravings bistro and Thai take out at Arches Thai the next night) are definitely recommended for good plain food. Since we were in vacation mode, we started a little late the next morning to see Arches National Park. 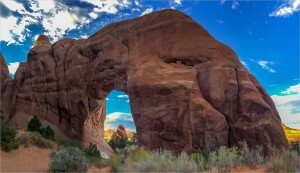 Arches boasts of a large number of natural arch formations -perhaps most concentration of arches in a given area. 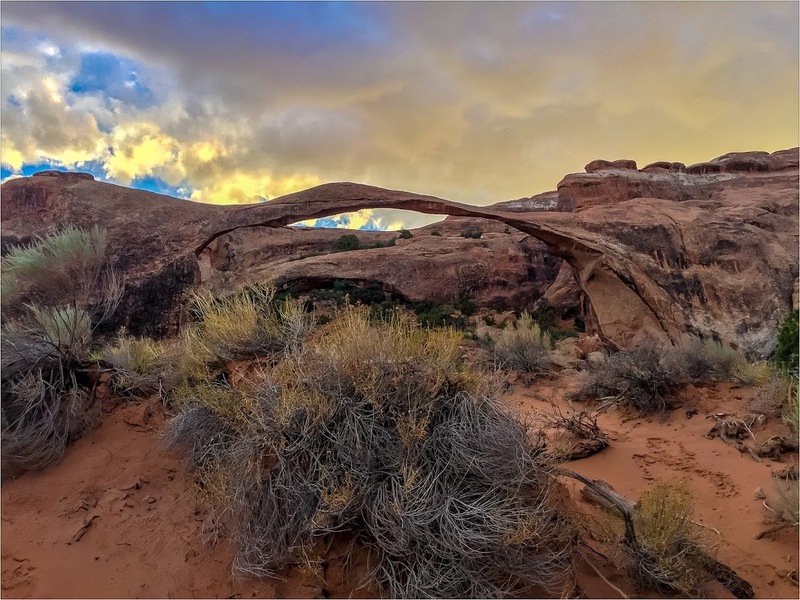 Shaped by water and erosion, these sandstone arches are constantly changing structures according to the whims of nature. The booklet provided by the National Park Service provided a great explanation of why the arches were formed – Annika spent a good bit of time poring over it. The whole driving trail at Arches is about 30 miles. I expected to see some of the arches evenly spread across this driving route but instead most of the arches are clustered towards t he end of the driving trail. That is not to say that there are no spectacular formations at the beginning of the trail. The rich red spires and towers and peaks of the Park Avenue section is awe inspiring, the balancing rock begs for a silly photo-op and the rock formation of the Courthouse Towers inspired all of us to find different animal forms in the rock formation (PS – I thought it looked like an elephant) . The first sight of Arches was the double O arch is a particular formation of two sets of overlapping arches that form a double arch. The arches span about 148 feet with a height of 104 ft – so these are pretty big formations. It was a short hike to get to the Double ‘O’ arch. Seejo took Tanay & Annika up with him to climb on the arch and they had a great time climbing up the arches and then sliding down. Most of the arches required a hike to get a good view. Some of these hiking trails are easy and short ( less than a mile) while some are more difficult. We decided to do only the easy ones but then we ended up hiking about 5 miles by t he time we were done for the day. However, the kids were wonderful troopers and hiked along with us (and without complaining) to the many view points to see the arches. 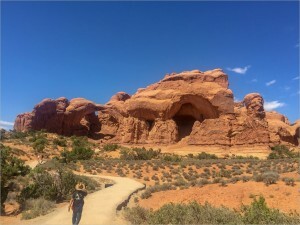 We hiked to see other arches including the landscape arch, the skyline arch, the tunnel arch and the Pine Tree Arch. My favorite one was the Pine Tree Arch . The kids especially enjoyed the trail to the Pine Tree Arch because it was covered in really fine sand – they made sure to lie in the sand and make sand angels. I was awestruck by the sweeping lines of the rock formations that make up the wall of the arch – really sort of engulfed us as we stood below it. The most famous arch at Arches was the Delicate Arch – we didn’t hike very close to it because the kids had already walked about 5 miles that day. Tanay only insisted on us carrying him a few times and was very solicitous of whether my hands were hurting. And if I said yes, he would quickly insist on walking by himself. It was dark when we left the Arches National Park, the stars were out in full force . Seejo insisted that he could see the planets and I didn’t believe him, till we downloaded an app to tell us what the stars were and could see Mars, Venus and Jupiter up in the sky – it was one of those rare nights where these planets all could be seen together. 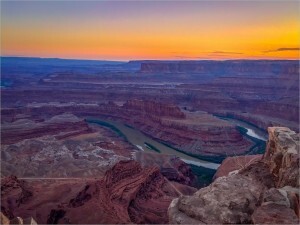 Seejo wanted to catch the sunrise the next day at Canyonlands National Park – so we set off bleary eyed at 6 am for a 50 minute drive from our hotel. 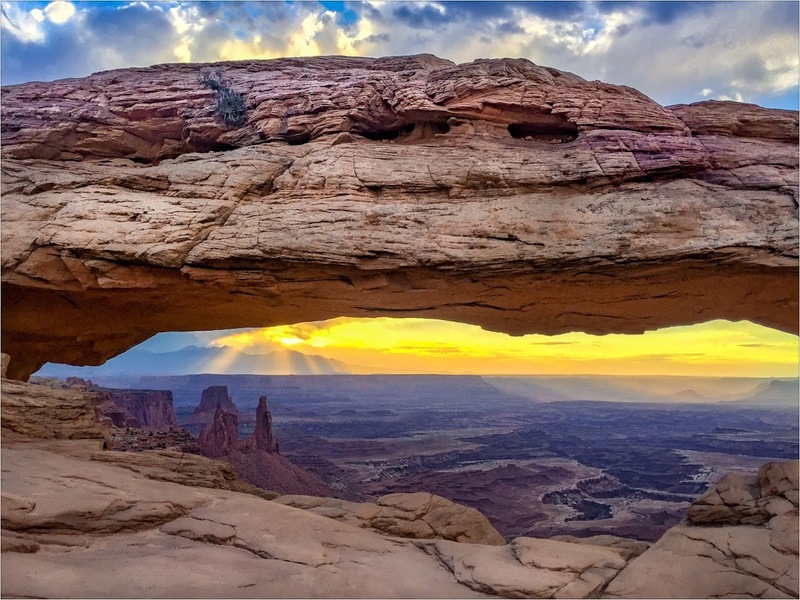 When we reached Canyonlands National Park, we realized that there are other enthusiastic photographers who clearly had the same idea. 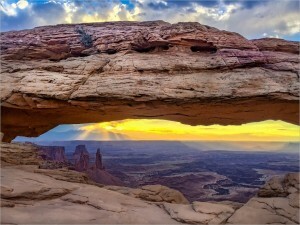 We did a 15 minute hike up a rather easy trail to the Mesa Arch at Canyonlands. The kids again were sporting about the trip despite the early morning wake up time and followed by a brisk walk (or a stroller ride in Tanay’s case). We did get to see a glorious sunrise and marvel at the startling effect when the first rays of the sun illuminated the dark valley and suddenly we could see the colors in the rock formations. W e rewarded the kids by letting them play in the hotel pool for the rest of the morning. We stayed at Fairfield Inn at Moab and they had an awesome pool – or rather pools. They had both a separate pool for kids and adults, each with its own waterfalls, a separate splash zone for the kids to run around it and two hot water Jacuzzi pools – all against the backdrop of beautiful red rocks. I would definitely stay there again , just for the pools. We had to fly back that afternoon and reached home around midnight. 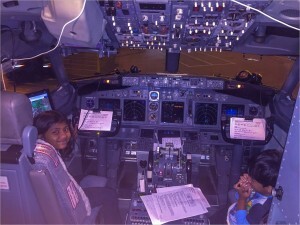 Another excitement was the nice pilot of Southwest Airlines who offered to let the kids get a picture inside the cockpit. Seejo and I were more excited about it than the kids but it rounded off a great trip.